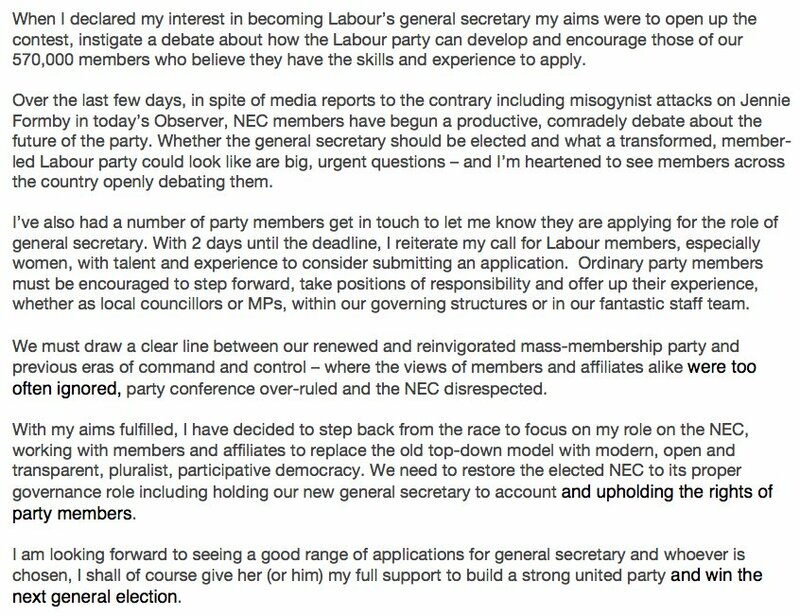 Amidst “misogynist attacks on Jennie Formby” Jon Lansman withdraws from race for Labour General Secretary. Contest for job of general secretary widens rift between Unite and Momentum. Michael Savage. Observer. “Senior backers of Jennie Formby, the Unite union’s former political director and the frontrunner to become Labour’s new general secretary, are trying to reassure party staff that there are no planned overhauls should she secure the job. “The split between Lansman and Formby supporters has also spilled into an online battle, with tensions among a group of leftwing blogs and news sites that emerged to support Corbyn’s leadership. The Skwawkbox, which is seen as having strong links with the leader’s office, has been pushing for Formby’s appointment and has questioned Lansman’s decision to run, while Novara Media, another Corbyn-supporting outlet, has backed both the opening of the contest and a member-elected general secretary. The internal tension has also seen the arrival of the Red Roar, a more centrist blog that details the fights raging within the ranks. Some moderate Labour MPs now believe the forces that brought Corbyn to power are dividing. The split has even been criticised by the Labour Party Marxists group, which said it was “at best, ludicrous and, at worst, irresponsible”. Now since these, if obviously mischief making, are clearly not misogynistic attacks what could Lansman be referring t? Apart from the ill-thought and condescending content, the tone of the last sentence sounds like a crib from Hancock’s Half Hour…. the Brave Hungarian Girl Magna Carta…. The Scottish aristocrat Andrew Murray (he’s descended from the earls of Perth and the kings of Navarre on his father’s side and the dukes of Norfolk on his mother’s) not only offers apologies for Lenin but Stalin too. He’s moved from Unite and the Communist Party of Britain to join Seumas Milne, another apologist for Uncle Joe, in Jeremy Corbyn’s office. This Blog is more concerned with Cohen’s attacks on UNITE. Apparently they and UNISON are “stale bureaucracies” with little interest in their membership’s day-to-day needs. Against these “old far-left-dominated unions.” Cohen advocates USDAW (whose new General Secretary Amy Murphy is a supporter of the ‘far-left’ Socialist Party), the Broadcasting, Entertainment, Communications and Theatre Union (BECTU), a section from the far-from-unbureaucratic Prospect union, and a small Independent Workers Union, whose origins lie in the (respected) far-left anarcho-syndicalist tradition of the Industrial Workers of the World (IWW), or the “Wobblies” which they left to form their own union, the IWGB. It is questionable if the “consensus” method of reaching decisions admired in the article, and made a rule in the Occupy movement, and prevalent amongst those influenced by certain strains of “alter-globalisation” activism and anarchists, is an answer to authoritarianism. Critics point to the imposition of a consensus by the loudest voices and the unsuitability of this model for union activity which, however we wish to put it, involves controversy and strong differences of opinion – normally resolved by voting contests between opposed stands. Cohen completely neglects the role of UNITE in organising the unorganised, and, above all, its ‘Community branches’ which campaign for the rights of those receiving benefits, for the disabled, and in coordination with those acting against the injustice inflicted on women through changes in the state pension scheme (WASPI – Women Against State Pension Inequality) The union is at the forefront of protests for such ‘far-left’ issues as defending the NHS. UNITE also works for the day-to-day interests of workers across a range of sectors, areas perhaps not striking enough to attract the journalist’s attention. That alone, given Skwakbox’s involvement in fake news (from Greenfell ‘D’ notices, to the claim that all the disabled would receive a ‘sanction’ if they did not get a job within 2 years) is cause for concern. Labour General Secretary election to play for as many NEC members hold out for third candidate. Red Roar. No one can claim to know how NEC members will vote, of course. This is not an exercise in mind-reading but an honest attempt to give as clear a picture as possible as to how the two main candidates for the job are likely to fare. Comrade Murray Leaves the Communist Party of Britain and Enters the Labour Party. The chief of staff of Unite’s leader, Len McCluskey, has left the Communist party to become a Labour member. Andrew Murray, who last year said communism represented “a society worth working towards”, joined Labour’s ranks recently, a Unite spokesman said. 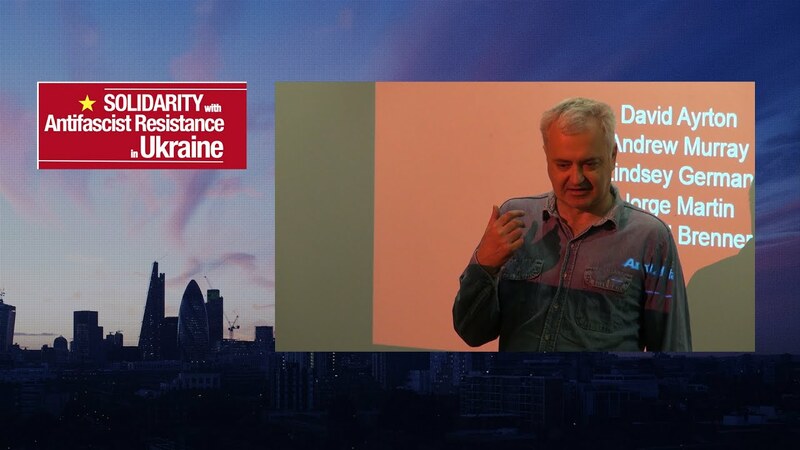 Murray, a former Morning Star journalist and longtime chair of Stop the War, said in a Guardian interview last year that his adherence to communism prevented him from joining Labour. Last week Murray’s daughter, Laura, claimed that members of the Alliance for Workers’ Liberty and other Troyskyist groups were seeking to take control of Momentum, the grassroots organisation that supports the Labour leader, Jeremy Corbyn, from its founder, Jon Lansman. “Jeremy Corbyn will inevitably make one compromise or concession that isn’t ideologically pure enough for them, and they will abandon him and Labour altogether to turn Momentum into a rival leftwing party,” she wrote. In her blog she further claimed that a row over the form of an internal voting structure at a meeting of Momentum’s national committee had ended in bullying and intimidation. She accused AWL members of bullying those whom they suspected of being “rightwing” or “alt-Stalinist” members. Richard Angell, director of Progress, the centre-left pressure group, said that with or without the AWL, Momentum – due to its intention to move Labour from the mainstream and deselect current MPs – remained a threat to Labour’s election hopes. “The argument that is being propagated by Lansman – and his media supporters Owen Jones and Paul Mason – is that Momentum minus the AWL would be totally fine. This is not true,” he wrote on his blog. This is one of comrade Murray’s recent contribution to left debate. Far be it for me to suggest that Cde Murray has joined Labour to engage in the fray against the ‘Trotskyists’…..